Two Step verification can be a bit of a pain at times if you work from lots of different devices, but what it means is, that if someone were trying to hack into your account on a different computer from yours (as is usually the case, unless they have stolen your computer) you will get a message alterting you to the fact that someone is trying to log in from another location. The hacker can’t log in to your account even if they have your password, without the SMS or Mobile app verification code which is sent to your nominated phone number or mobile app on your mobile device. If they have stolen your mobile device or phone, you’re in trouble. This also means that every time you log in from a different new device (phone, iPad, laptop, work PC etc..) you do have to go through a process where a code is sent to your phone, and then enter it into your Google account before you get access to your account. Once you have done it for each device you use, then you won’t have to do it again, unless you clear out your browser cookies, which I do from time to time, then you have to do it again. The other thing with 2 Step verification is that you also need to verify your apps that log in with Google, like YouTube and Flip board and Google plus. You might find that on your phone for instance after you have enabled the 2 Step verification, when you try to log into your Phone YouTube app, it gives you an “incorrect password” message. You need to then go to your Google security settings (see below pic) through the browser on your PC or phone, if you have enabled it, and generate a one time random password for that app. Just follow the instructions in the security settings. Put in the name of the app you wish to enable, for example “YouTube for my phone”, and generate a one time random password, it will appear as a random string of numbers and letters, you need to put that in the place you would normally put your Google password in on your phone. You only have to do this once. Then after that time you can log in to that app on your phone with your usual Google password. To enable two step verification on Yahoo go Here: and sign into your profile, click on the settings cog wheel (top right) and select Account Info then scroll down to Sign-In and Security, and Set up your second sign-in verification. It’s a good idea to also update password reset info, with some strong security questions. To further protect your online applications you should really enable 2 step verification on your Facebook Account also, just go into your Account Settings/security settings and enable Login Approvals on Facebook to do a similar type of thing. On Twitter click the Settings Cog Wheel top right and click on “Security and privacy” in left side column. 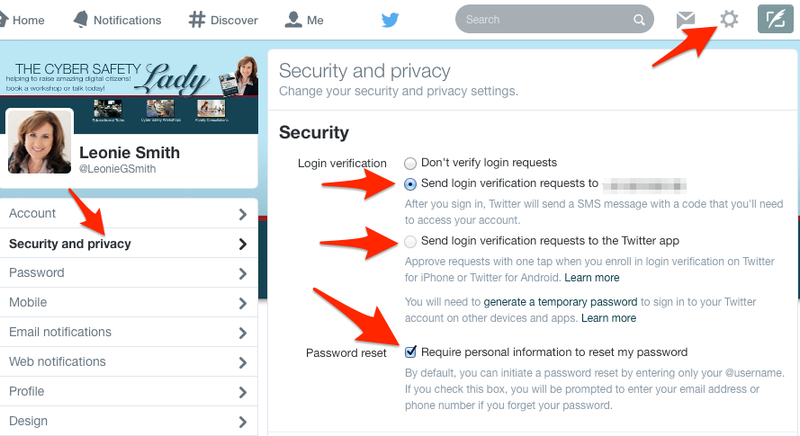 Click “Send login verification requests to” and enter your phone number, or have log in verification requests to your Twitter app on your phone. Ensure that “Require personal information to reset my password” is ticked in your profile settings. Remember use strong memorable passwords! And use a different password for every single log in!